Southern In Law: SIL Sisters in Christ: Ask for ANYTHING and You Will Receive?! 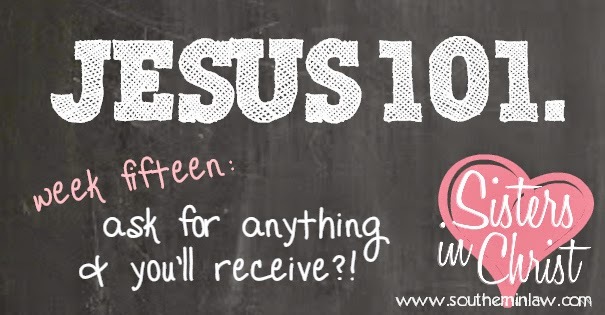 SIL Sisters in Christ: Ask for ANYTHING and You Will Receive?! Hey sweet sisters! I took a little break last week with our Sisters in Christ post as we've been so busy and I haven't had enough time to dedicate to writing the kind of post I want to share with you all. You see, we shouldn't look at Bible Studies as a "get it over with" kind of thing. It shouldn't be a task we just want to tick off - it should be something we want to do, because it's an incredible privileged. We are so lucky that we have a God who gives us His word to follow - He doesn't just leave us on our own to figure things out for ourselves, He guides us through the Bible and speaks through His word and into our hearts. Today, we're continuing our Jesus 101 study on the Gospel of John, today looking at John 14 - and it's here in this chapter that Jesus really comforts His disciples with a few very important promised - but we're going to take a look at what those promises mean for us. Some people like to think of this promise as a blank cheque - we can ask for anything and Jesus will put it on God's to buy list and all of a sudden it will appear out of thin air. In Jesse's dreams, that thing would be a ferrari - but we all know we won't be driving around in one of them anytime soon. We all know that this blank cheque idea doesn't work - and it's actually a good thing that it doesn't! Some people wish for a park at the end of their street whilst their neighbours pray for peace and quiet. Farmers pray for rain whilst Mothers pray for sunshine so their kids don't destroy every inch of their house. Someone selling their home prays for a great price whilst the buyer prays for a bargain. If God answered every single one of our requests, the world would be even more broken and confused than it is now! Even if we all somehow managed to agree on what we wanted, we would be telling God how to run the universe - and we all know we don't know how to do that. So what did Jesus mean when He promised His disciples that whatever they asked in His name they would receive? We get that we don't write out a must-have list, pass it on to Jesus who then hands it over to God and the things of our dreams all of a sudden appear on our doorstep - so what is Jesus telling us to do? Jesus tells us that we have permission to go to God directly because God loves us just as much as He loves His own Son! Isn't that awesome?! This is brought up again and again in the Bible - Hebrews tells us that Jesus gives us permission to go to God directly. Jesus eliminated the need for a middle man as He gave us the opportunity to have a relationship with God - so what does it mean to ask in the name of Jesus? You see, we're not specifically speaking about Jesus's name here. It's not a secret access code to the vault of God - and it's not a magic word to get us straight through to God rather than waiting on hold in the prayer queue. When we talk about the name of Jesus, we're really talking about how incredibly important He is. When we pray in the name of Jesus, we're not dealing with a special word - we're dealing with a special person. When we pray in Jesus's name, we're praying according to the way that He is - according to His nature. What Jesus is telling us is that our praise and requests need to be inline with His character. When we pray in Jesus's name, we're not giving ourselves a free pass to receive whatever we want. Rather than forcing Him to conform to our wants and desires, "in His name" actually means the opposite; we are conforming to His wishes and acting within His will. When speaking in His name, we need to make sure that we're saying something He would agree with. We're conforming to the word's of the Lord's prayer; let your will be done on earth as it is in heaven. 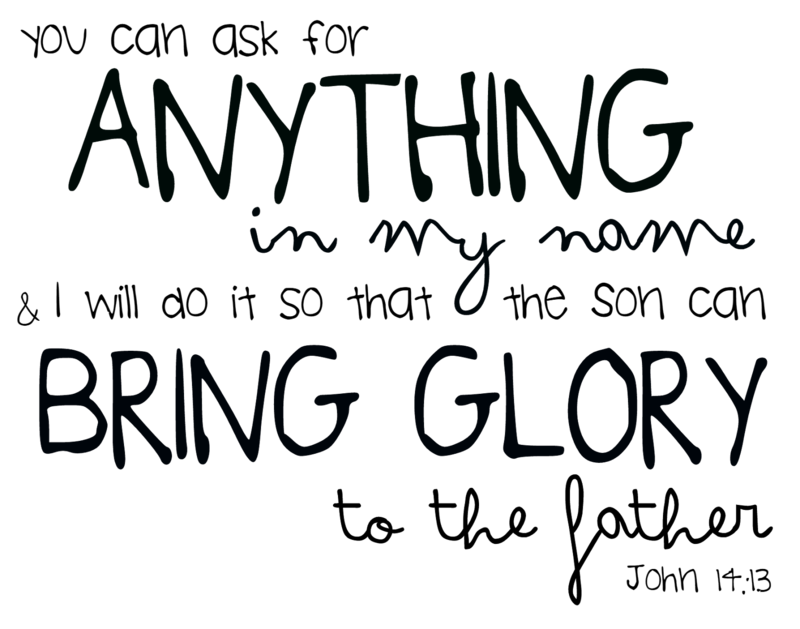 "In Jesus's name" is our affirmation that, to the best of our knowledge, our request is within His will. But you might be thinking - if we have to pray according to God's will, what's the point of praying? Shouldn't He just do what He wants anyway? Why are we asking God to do something He already wants to do? God is the one who is telling us to pray, though. Ih his wisdom, God decided to do certain things only in answer to prayer. Sometimes this is so that we will learn, through the process of prayer, what His will is for our lives - and whether or not our requests are for selfish purposes. We don't always understand what God's will is - and sometimes we don't realise that the things we really feel we need and desire aren't actually the right things for our lives. We also don't know whether or not God's will is set in stone. He loves us and gives us the opportunity to make so many of our own choices - from whether we follow Him to how we act out our daily lives - and this is where prayer can really help us. Prayer not only changes us, but it also affects what God does. God has the power to carry out our wishes, the compassion to help us when we need help the most and the wisdom to know what we truly need. In Phillippians 4:6 we are told "In everything, by prayer and petition, with thanksgiving; present your requests to God". Jesus has given us the authority to ask. Whatever is on our heart, and whatever it is that we desire, we should ask God for. We can trust God to answer in the best possible way, at the best possible time - and when we do that, we can be confident that we are praying in Jesus's name. PS: I'm currently working through and loving Soul Survivor's Bible in One Year App (available free on both the App Store and Google Play) - if you're looking for a new bible study for 2015, it might be worth a look!